Jazz hands. Lots of jazz hands. Starting with cardio, alternate cardio + strength song tracks. Don’t worry about order or reps – just keep moving the whole time. Singing encouraged to strengthen the lungs. Continue alternating until one of you cries. Added disclaimer: I’m not a personal trainer. This post is not intended to be instructional but is a recap of my experiences. Please do exercises at your own risk and keep baby’s safety as top priority. Do you use Pinterest? I did these two workouts today (I live in SoMD, so we’re probably dealing w/the same storm): http://pinterest.com/pin/83809243037449900/ & http://pinterest.com/pin/83809243037395494/. Wall sits…Ouch! My daughter (17 mos) LOVES when I exercise at home! She’ll stretch with me and give me hugs of encouragement and is fascinated by my sweat. She also likes to get our the mat when I’m not working out as a not-so-subtle hint. Haha! I use to work out with/around my baby when we were home on maternity leave. I did a lot of squats and grapevines while holding him! 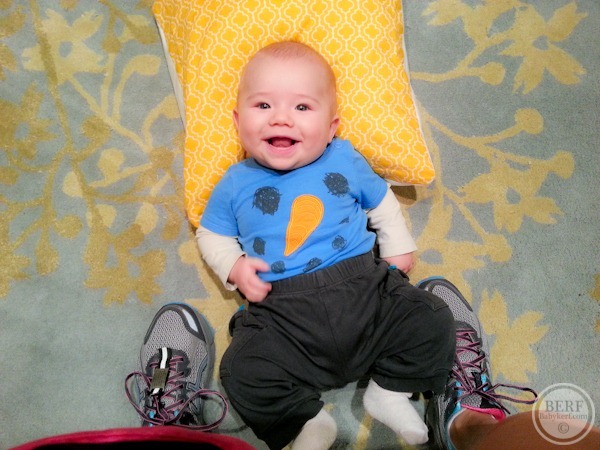 This post is cute and I totally commend your ability to find a way to get a workout in. But is all of this safe? Over-the-baby rows? Are you holding weights over his head? That makes me nervous. Maybe I’m just thinking of the worst case here and by “over-the-baby” you mean you just did this stuff while he is set up somewhere safe? 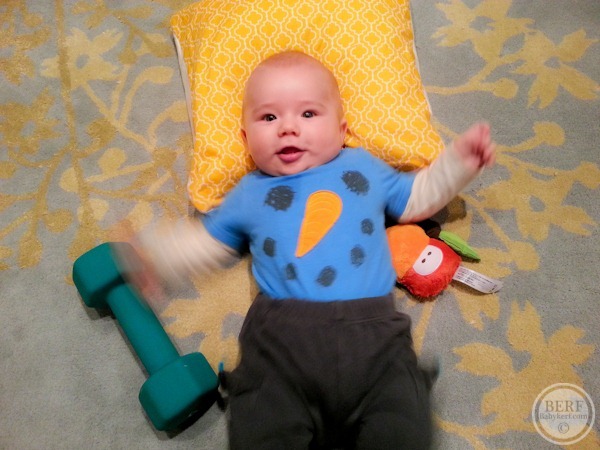 I love the idea of working out at home with a young baby (or with older kids! ); however you can fit it in! I was also surprised by your “over-the-baby” exercises. I’ve been a long time reader and I don’t mean for this to be judgmental or critical, but this is truly meant to be a message about safety and responsibility. As a certified personal trainer, it makes me uncomfortable when someone without a relevant degree or certification, who also has a large audience of readers, suggests workouts without giving proper instruction, links to proper instruction, or some kind of disclaimer. Although some people might realize what you actually meant, giving more detailed, educated information or resources would be the best and most responsible way to ensure safety for anyone who may try the workout ideas. I’m sure all of Kath’s regular readers would definately realize what she meant. There is absolutley no way she would ever endager Mazen and for anyone to suggest such is really going way over the top. As for her not being a “Certified Personal Trainer”, from the amount of exercise and workouts that I have seen Kath doing over the last 5 years I would trust her recommendations but would take it for what it was, a light hearted post on a baby blog. Well, I’ve been reading Kath since she was pregnant and I didn’t know what she meant, or I wouldn’t have asked. You can’t idiot proof every thing in life! People have to be responsible to themselves for deciding what is safe and what they feel comfortable with. Furthermore, I don’t feel that Kath was suggesting other people do these exercises, she was simply telling everyone what she does. I feel that if you were truly trying to “not mean this to be judgmental” then you would have inserted links to proper instruction (after all you are the expert), seeing as you are sooo concerned for her readers’ safety. Actually, I though Jen brought up a really important issue and I didn’t read it as judgmental but more as concern. 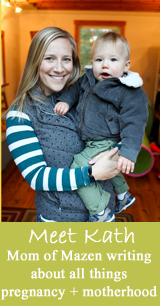 We all know that things can happen in the blink of an eye and I feel like taking extra precautions around an infant, even if it seems like overkill, is smart. I have to admit that I winced at the line about over-the-baby pushups (with kisses), since that seemed to me like a literal ‘directly above baby’ exercise. Maybe I misunderstood that. And I just winced at your wince – you don’t ever get down on the floor to play over your baby? I’m sure Kath can do a pushup without worrying about collapsing on top of her infant. I’m pretty sure “playing over my baby” and “doing pushups over my baby” is not the same thing. I have exercised almost daily since my 20’s (I’m in my 40’s). There have been a few occasions when I experienced unintentional muscle failure, so that’s the first thing that came to mind. Again, it’s concern — not judgement. Janet, nobody doubts Kath’s ability to do a push up, but can never be too safe. What if she pulled something or her elbow gave out? It’s just better to err on the side of caution. Interesting… I went to yoga the other day, mom/ baby yoga with my 4 month old. At one the best yoga studios with a certified instructor we did push ups over our babies and gave them kisses! Moms and babies loved it! Keep up the great work Kath! Such great ideas! I’m so glad I found your blog 🙂 I’m pregnant with my first and working on an online Pilates program that mom’s can do from home. Love reading your posts! Love this! When I get home from work, after our floor play time, I’ll put him in the baby carrier and walk around our home doing squats and lunges. Such a good burn with my little 20lb-er. “until one of you cries”- LOL! Mazen clearly wants to grab the weight and pump it in that last picture! 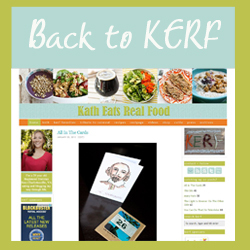 Hi Kath, I love your blog, I read every single day, I check 2 – 3 times a day for new posts. I love, love, love Baby Kerf and pictures of Mazen. I admire so many things about you. But what I don’t understand is why you don’t delete negative comments. It seems that some people like to pick you apart and it really gets on my nerves. Your attention to detail in all aspects of the life you show is great! To even suggest that you would put Mazen in any danger is so rediculous. Anyone who reads you on a regular basis would know this. I think if it were my blog I wouldn’t give them any attention so they would go away. The survey was really neat, can’t wait to hear the results. Love this idea! I will try my own combination… I don’t have a baby (yet), but I’m sure a cat would be a fine substitute!